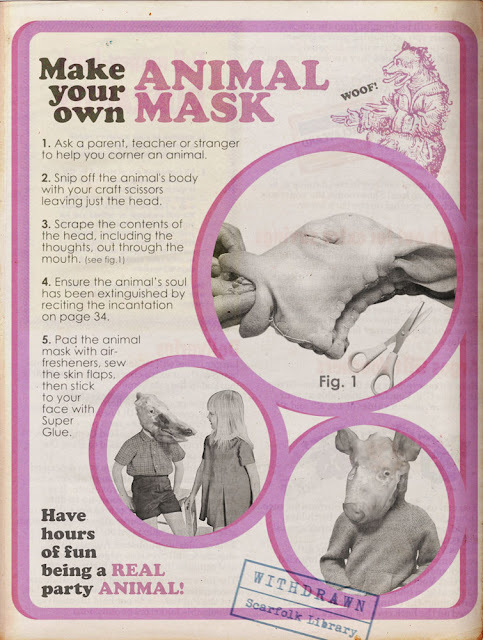 In 1970s Scarfolk, children liked to make Halloween masks out of everyday household items such old curtains, ritually-sacrificed livestock and executed criminals. The latter were so sought-after that mischievous children planted evidence of crimes that ensured the arrest and capital punishment of relatives in the hope of inheriting a head with which to make a mask. Happy Halloween/Samhain from everyone at Scarfolk Council! 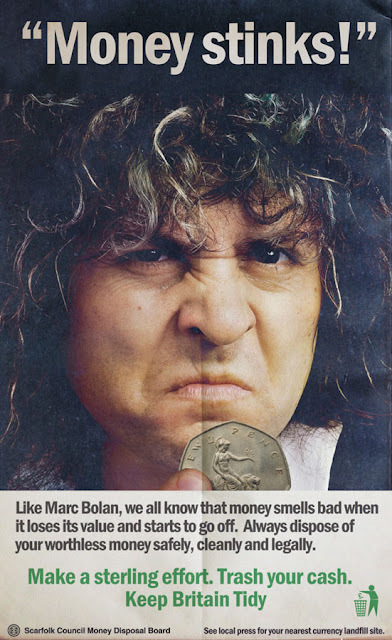 When the pound's value suddenly plummeted in 1972 to its lowest in 170 years and became virtually worthless, people started throwing out all their money. Piles of discarded coins and banknotes littered the streets. Scarfolk's binmen were so overwhelmed that they went on strike, demanding a £4 pay rise. 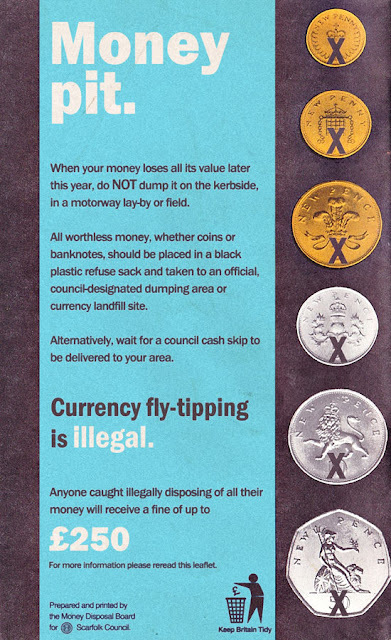 Despite campaigns to stop currency fly-tipping (see above and below), the government, unable to cope with the mountains of useless sterling, created an ingenious scheme: It advised citizens to hold on to their money and use it instead to trade for basic items such as food and shelter. It even suggested that interim emergency values be attributed to the useless cash. The recommended value for a five pence piece, for example, was five pence. The only way Britons could earn real money was by making tea and biscuits which were rushed in mass flotillas of little ships to the continent - evoking the evacuation of Dunkirk - where they were sold to Europeans on their tea breaks. 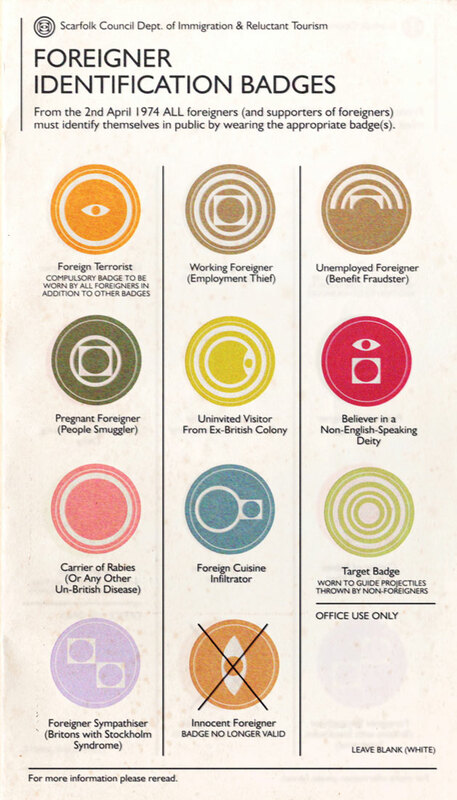 While politicians debated a points-based system for immigrants in the early 1970s, Scarfolk went a step further and introduced a similar system for existing citizens. The council didn't see why it should be burdened with unimportant, objectionable people. 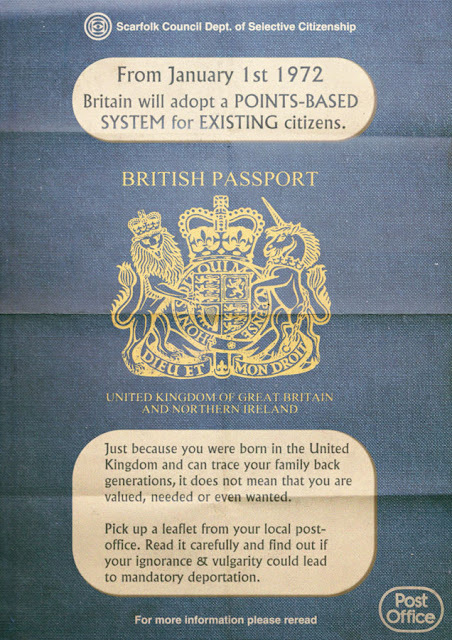 Surprisingly, many citizens had never even entertained the idea that their country of birth was purely accidental and that their value to society might be lower than that of a pack of disposable nappies or a plate of tripe*, never mind better educated, more civilised foreigners. Between 1972 and 1976 thousands of British citizens were deported to an immense raft which floated five miles off the coast of Blackpool. Realising that they were now the foreigners they had previously denigrated, the deportees hurled racist abuse at themselves and each other and frequently got into fights. * see Citizen Values for further details. From 1974, all foreigners (as well as citizens friendly to foreigners) were required by law to wear identification badges. The image above is just one page from a hefty, six volume guide distributed to local councils and border officials. The glossy guide and badges were so expensive to produce that they were manufactured abroad because the dwindling UK print industry no longer had adequate resources. Additionally, the first print run of the guide had to be recalled after a typo was discovered: A foreign typesetter had accidently rendered every instance of the word 'British' as 'Brutish'.